Deception Pass State Park has an important and unique designation — it’s Washington State’s most visited state park. That’s no small feat in a state park system that has more than 200 parks to its name. But this park more than earned its spot at the top. For one, its scenery is simply stunning, with an amazing bridge, trails, cliffs and coves, beaches to explore, a lake to swim, and more. The park itself is 3,854 acres, spanning over two islands with that amazing bridge stretching between them. It has 77,000 feet (that’s almost 15 miles!) of saltwater shore and 33,900 feet of freshwater shore along three lakes. In short, there are lots of places to explore and lots of space to do it. It’s tough to find a better low-budget, outdoorsy vacation in the region. Deception Pass State Park has no shortage of things to do. Stay for an hour, the day, or even stay over night and really delve into exploring this fantastic park. As with most Washington State Parks, hiking is one of the top ways to explore the park. With 38 miles of hiking trails, there are trails galore to choose from, including 1.2 miles of ADA trails, 3 miles of bike trails and 6 miles of horse trails. 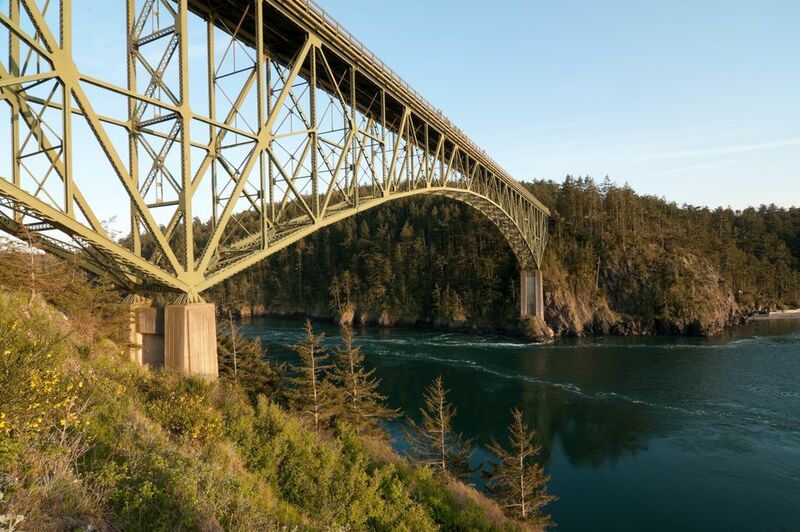 One of the quintessential experiences to have at Deception Pass is crossing the Deception Pass Bridge where you can experience some of the views the park is famous for. Other trails worth checking out include the Goose Rock Summit and Perimeter Trail, hiking out to Lighthouse Point, or hiking along the beaches. Beachcombing and tidepooling are also both popular with the miles of shoreline at Deception Pass. You can’t really go wrong with any stretch of shoreline in the park, and you might even spot seals or sea lions chilling out on the rocks, but West Beach is an iconic spot to enjoy views of the Puget Sound, the Olympic Mountains in the distance and the San Juan Islands. If you prefer swimming, look to Cranberry Lake (the Puget Sound is really, really cold), which is not far from West Beach. The lake has a sandy beach and an enclosed swimming area and tends toward the high 50s, which is still not exactly tropical, but is doable. The lake also has a boat launch and is open for boating, kayaking, fishing and other watery fun. You can look for wildlife and birdwatch throughout the park. You might spot sea lions or seals on shore. Birds of all sorts live throughout the park. And if you’re in a quiet area, stop, wait and watch — plenty of other Northwest wildlife makes its home here. Deception Pass State Park is well outfitted with facilities for both day use and overnight visitors. You’ll find picnic tables, fire pits, horseshoe pits, and even two amphitheaters within the park’s bounds. There are two interpretive centers in the park. The Civilian Conservation Corps Interpretive Center is located in the Bowman Bay area and tells the story of the CCC in the 1930s — the CCC built the majority of the nation’s state and national parks. You’ll also find the Sand Dunes Interpretive Trail at West Beach where you can learn more about the ecosystems and plants at the park. For younger visitors, there’s a playground. And for anyone who wants to stay overnight and keep the exploring, you’ll find a whopping 172 tent sites for camping, 134 partial hookup sites, 20 restrooms (four ADA) and 10 showers (four of which are ADA). You can get to Deception Pass State Park one of two ways. The most direct if you’re coming from the Seattle is to take the Mukilteo Ferry to Whidbey Island and then drive through Whidbey Island up to the park via Highways 525 and 20. However, you are also subject to ferry delays and waits. If you want to skip the ferry or you’re coming from the north, you can also catch Highway 20 from I-5 out of Burlington, which is located about an hour north of Seattle. As Deception Pass State Park is a state park, you will need to have a Discover Pass. You can buy a pass online in advance or use on the automated stations available at the park. Day use Discover Passes are $10, and an annual pass is $35. Boat permits are required if you launch a boat from the park. To launch a boat, you need one of three things: an annual boat launch permit; an annual Discover Pass and a daily launch permit (which you can buy at the park’s automated stations for $7); or a daily Discovery Pass and a daily boat launch permit, both of which are available at park stations. The top thing to do near Deception Pass is to explore Whidbey Island. The quaint town of Oak Harbor is just south of the park entrance on Whidbey Island and you’ll find plenty of restaurants and galleries. Whidbey Island is also home to a few smaller state parks like Dugualla, Joseph Whidbey, Fort Ebey (a great stop if you appreciate some military history alongside your nature). Fidalgo Island is just to the north and includes the town of Anacortes, where you can catch ferries to the San Juan Islands.